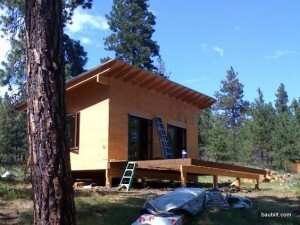 Following are some progress photos shot by my father-in-law Joe on site this week. 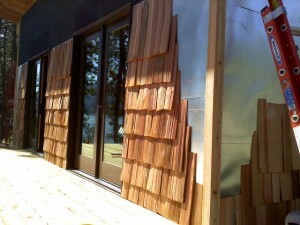 There is undeniable magic in seeing a structure materialize. The magic is accentuated by having been 2500 miles away for the entire process and only seeing a fairly significant intermediate product (as shown in the photo). Of course there is also some remorse (yikes…is there enough glass on the front facade…), but still, it’s pretty fun to see ones design appear. BTW, the builder Jim Burrowes is really good. There are “framers” and then there are Montana builders who happen to do framing because it is part of the job. Jim does nice crisp framing (along with wiring, plumbing, finish carpentry, and more…). The sleeping pavillion from the front. A minimalist structure. Still, the tapered rafter tails are nice, no?